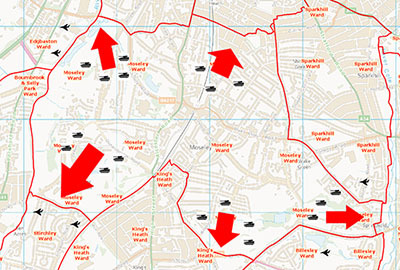 Moseley’s Spring Offensive began last night with historic gains on all fronts being reported. Whilst much of South Birmingham spent the weekend arsing about with barbecues, meticulous preparations from Moseley Militias meant that many of our neighbours were caught unaware as tanks rolled across their borders. Notable gains include Highbury Park, Cannon Hill Park, Balsall Heath Park, Moseley Bog and the Milan Sweet Centre. One unexpected gain has been a significant part of Kings Heath’s Pineapple estate. Current residents will be invited to demonstrate whether they do hold Moseley values and if not their houses will be cleared and made into an artists collectives. Although we have seen some important wins, much heavier than expected fighting on the Eastern front has meant that, as yet, we’ve been unable to secure Sarehole Mill from the people of Hall Green. Sarehole Mill is an essential part of the Moseley story that we’ve spread throughout the country via advertorials in Sunday papers; as such it cannot remain with people that don’t understand its value. A second push is expected before the Local Boundary Commission brokered ceasefire kicks in on June 20th. This truly is a victory for the Middle Classes making a bit of a fuss.